Visit Yowza Fitness online at YowzaFitness.com for all your fitness needs. Yowza Fitness is committed to providing a commercial quality product via their direct-to-consumer distribution model which will save up to 60% off of comparable retail items. Since Yowza Fitness is the only online seller of fitness equipment that is actually owned by the factory they provide superior commercial grade products at over 50% off of traditional retail prices. Yowza Fitness exercise equipment includes both folding and non-folding treadmills, fixed motion ellipticals, and Variable Motion Ellipticals. Save on your next purchase from YowzaFitness.com with Yowza Fitness discounts, Yowza Fitness coupons, Yowza Fitness promotions and Yowza Fitness savings from 58coupons.com. Enjoy a $100 discount on the Keewadin Treadmill from YowzaFitness.com with this coupon code. Click to view. YowzaFitness.com wants you to be happy with your purchase so they offer a 60 day money back guarantee on all their products. Click link for details. 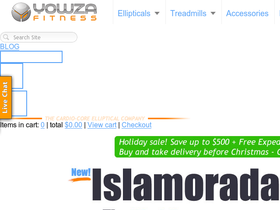 For a limited time only save $300 on the Captiva Elliptical Machine from Yowza Fitness. Click to view.